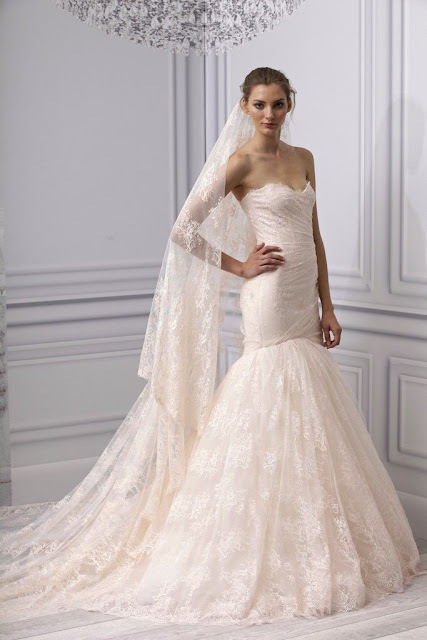 Any wedding planner worth their salt will tell you - the dress is at the heart of the wedding. 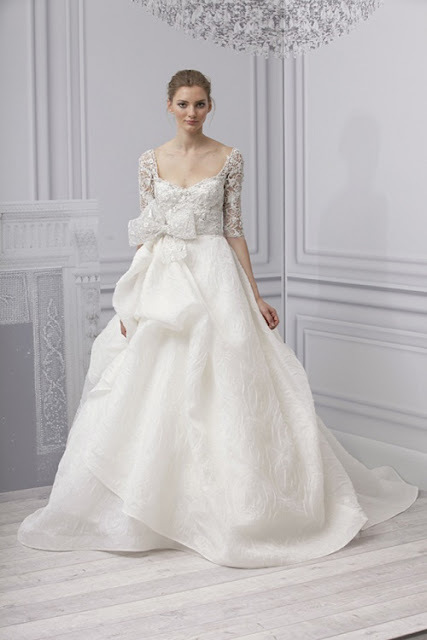 Not just as a once-in-a-lifetime beautiful take on the fairytale all grown up, nor simply as all eyes will be on you in your dreamy frock (before very likely shedding a few tears), but as the linchpin of the style, mood and feeling of the big day itself. Lace will inform the flowers, skirts of spun sugar speak of pure fantasy and romance, sleek chic styles inspire clean, fresh lightness but can equally carry pops of colour, gold and fantastical detail to contrast to such simplicity. Which is why this past week's New York Bridal Fashion Week is such a treasure trove of wedding inspiration, and why I'm so excited by all of the wedding style it will surely translate into! This is about so much more than just the dress or one big swoon: after all, choosing your dress comes down to a matter of gut instinct, feeling and heart - a little like falling in love and finding your 'one' (you know, that lucky chap you're going to marry). Prepare to fall head over heels many times over, and whilst you're at it - find your wedding style, too. Like an exploded glitter ball smattered over the sheerest silk voile topped sweetheart bodice, Monique Lhuillier's Spring/Summer 2013 collection played out every bridal fantasy. 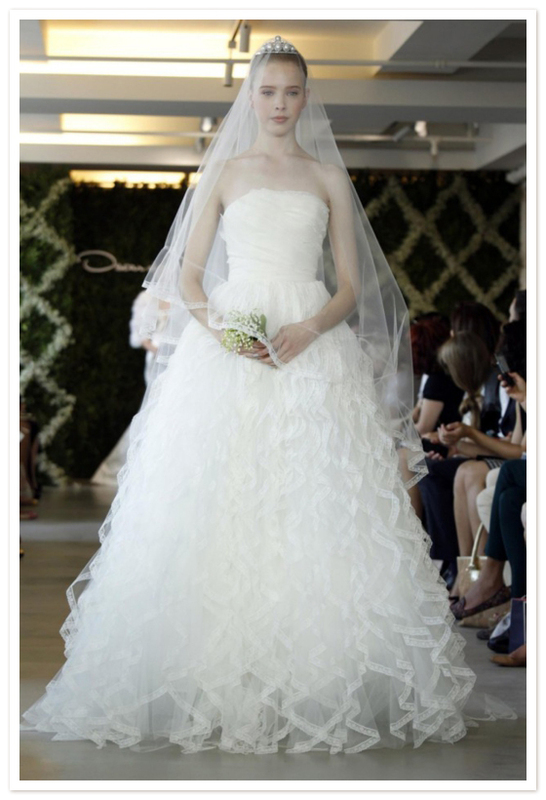 We loved the sweetheart styles cinched with a stiffened bow at the waist and the whipped cream folds of puffed skirt dresses paired with either a low-cut gilt-beaded lace bodice with bracelet sleeves or a strapless gathered style. Blush rose-point lace fishtail gowns and a nod to the demure trend kick-started by a certain Royal bride last year (as also seen at Oscar de la Renta and Amsale in sweet lace cap-sleeves) also marked these dresses out as ones we would fight tooth and nail for. Oh, Oscar! 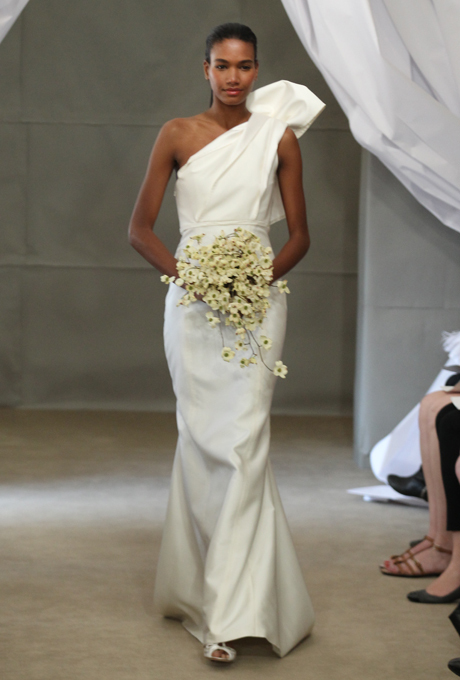 You had us at hello with what can only be described as dresses that make the heart stop. 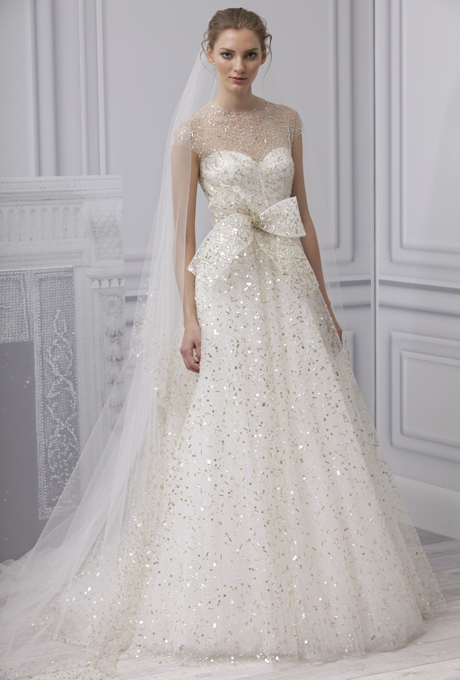 From siren trumpet silhouettes with pulled tulle detail and tulle capes no less, to little Chanel-esque natty suits straight from the Betty Draper and Grace Kelly style book, or Oscar's trademark princess-line ballgowns with their teeny tiny bodices erupting into lashings of millefeuille skirts: every dress made my head spin with moodboards before the bride had reached the end of the catwalk. 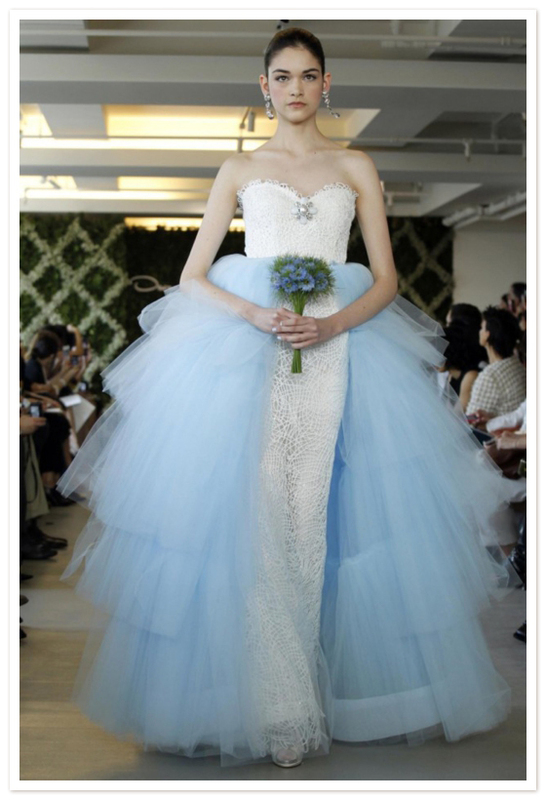 One jaw-dropper gown of forget-me-not blue tulle pannier skirts framing a tiny guipure lace worn by a model who resembled a young Liv Tyler (which helps every time) should come with a warning to asthmatic guests, it's that likely to take the breath away. 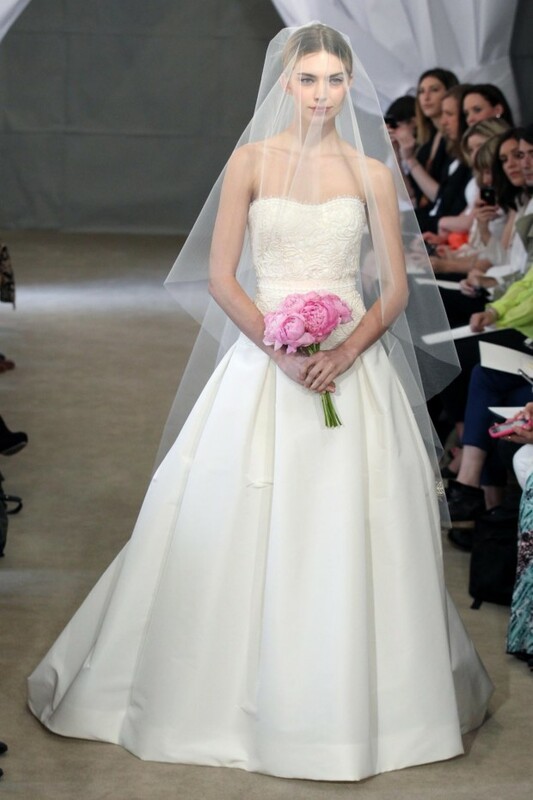 Carolina Herrera kept it pure American Sweetheart in her pretty, feminine way with one-shouldered and strapless evening gown styles in Duchess silk satin or matt taffeta with fluted skirts through to those classic, lovely ballgown dresses she's known for. 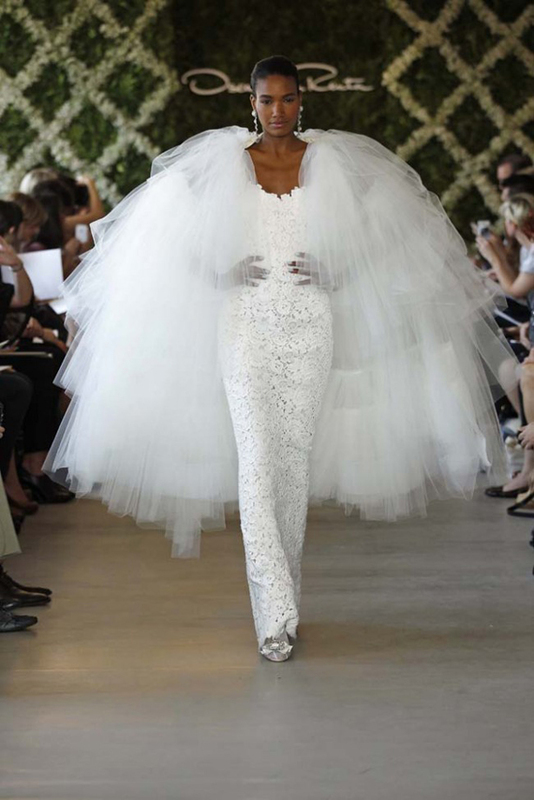 Dispelling once and for all the belief that brides can only wear white, Vera Wang has been shaking up bridal wear with increasingly grand and startlingly gorgeous hues. For her Spring/Summer 2013 outing, she showcased dresses in (wait for it) jewel like crimson, velvety plum, red straight from a Velasquez portrait and deep ruby. 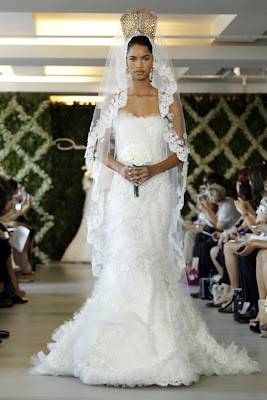 If you're a truly free-spirited bride, this is one knockout way to rock the aisle, and are actually surprisingly wearable and not an inch short of the bridal fairytale when it came to style, cut and Vera's signature romance of texture in flange skirts, clouds of the finest honeycomb tulle, horsehair stiffened architectural flourishes and Chantilly lace applique. But the good news is, these beauties are also available in ivory and traditional white too, and lose none of their impact or supernova style. 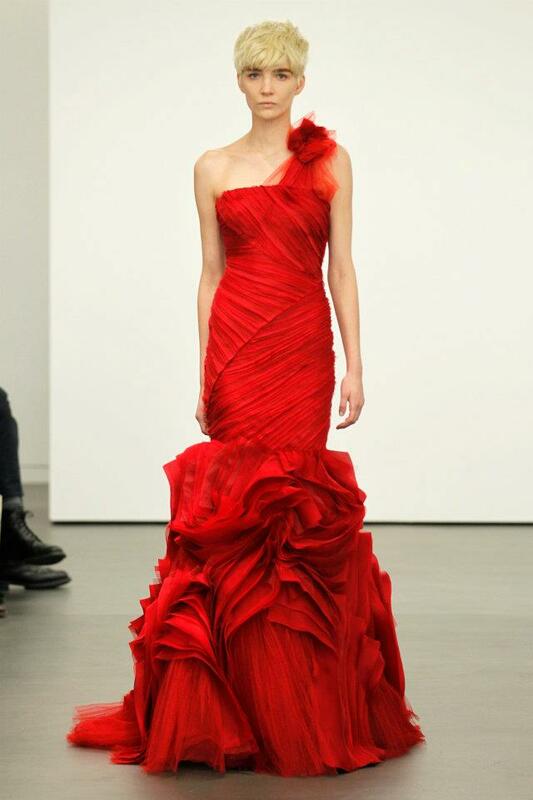 Oscar de la Renta also showed a scarlet gown featuring ladders of silk against gauzy tulle layers, as did Romona Keveza too.